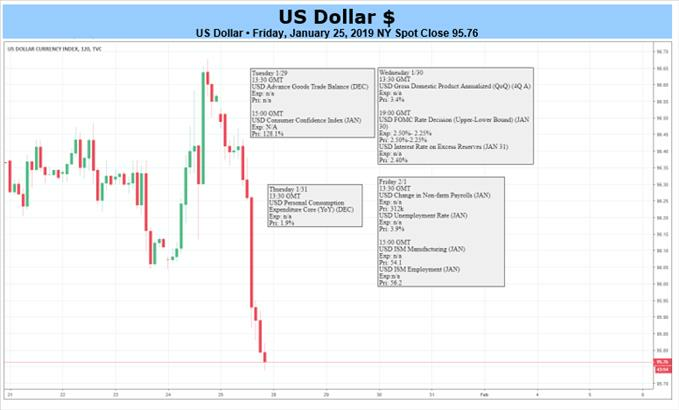 (MENAFN - DailyFX) US DOLLARFUNDAMENTAL FORECAST: BULLISH US Dollar gains as global stocks break 6-week winning streak Global growth fears may continue to stoke haven USD demand Brexit, US border policy and US-China talks are wildcards Gain confidence in your US Dollar trading strategy with our free guide! Looking for a technical perspective on the US Dollar? Check out the Weekly USD Technical Forecast . The US Dollar roared higher, scoring the largest gain in six months last week. Most of the move occurred against a backdrop of deteriorating risk appetite, as expected . The MSCI World Stock Index snapped a six-week uptrend amid swelling global slowdown fears, stoked by ominous comments from the RBA and BOE as well as signs of trouble in Brexit and US-China trade negotiations. Meanwhile, the first RBNZ policy statement since November and soundbites from a gathering of the Eurogroup may keep worries about slowing growth in the headlines. On the political front, the UK Parliament will vote on alternatives to Prime Minister May's defeated Brexit withdrawal bill as US officials scramble to reach an immigration policy compromise before stop-gap funding for the government expires Friday. On balance, this speaks to the kind of environment that is likely to inspire de-risking across financial markets. That bodes well for the benchmark US currency as its unrivaled liquidity serves as a magnet for haven-seeking capital flows. A longshot political breakthrough on either side of the Atlantic or perhaps even between Washington and Beijing seems to be the most significant risk to such a scenario. New Zealand Dollar Forecast NZD/USD Looks Vulnerable. How Dovish Will the RBNZ Turn Next Week?